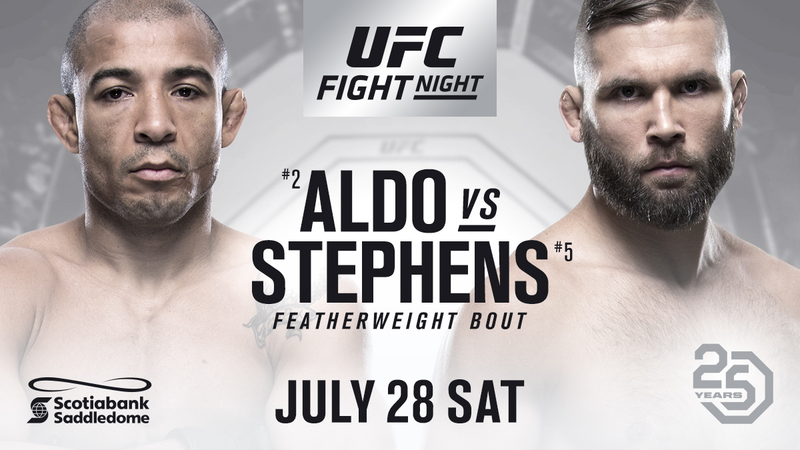 Back in Calgary for the first time since 2012, the UFC will visit the Scotiabank Saddledome on Saturday, July 28 for an action-packed event featuring the Octagon's best. Nine bouts for the UFC Fight Night card, which airs live on FOX, were made official Friday, including the co-main event, which sees a featherweight legend returning to the country where he delivered one of his greatest performances, as former world champion Jose Aldo fights in Canada for the first time since his epic win over Mark Hominick seven years ago against surging knockout artist Jeremy Stephens. Plus, Ontario's Alexis Davis continues her quest for a title in the women's flyweight division as she faces rising star Katlyn Chookagian. Equally ambitious is another Ontario product, Randa Markos, whose chase for gold at 115 pounds leads her to a matchup with Nina Ansaroff. In flyweight action, Dustin Ortiz faces Matheus Nicolau, and at 205 pounds, it's a clash between Gadzhimurad Antigulov and Ion Cutelaba. A quartet of Canadians will also get a home game this summer, with Jordan Mein taking on Alex Morono, John Makdessi battling Ross Pearson, Kajan Johnson squaring off against Islam Makhachev and Hakeem Dawodu making his second Octagon appearance against Austin Arnett. Tickets for UFC Fight Night go on sale to the general public at 10am MT on June 1.